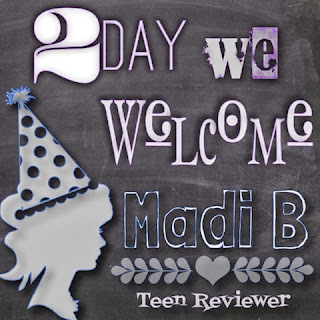 I'd So Rather Be Reading: Madi B, A New Pep in Our Step! We are so excited to introduce our new teen blogger, Madi B! Madi is a teen who loves to read just as much as we do. She actually reminds us of Kelli (18 long years ago). She's a fellow Anne of Green Gables fan, can read a book or more per day, and always has a book in her hands (all just like Kelli!). Natalie knew she was the pep in our step we were looking for! She will be the teen voice for ISRBR and we will continue to be the Peanut Butter & Jelly. Madi will be reviewing YA and maybe even some MG books. Welcome to I'd So Rather Be Reading, Madi! Saying "I love to read" would be an understatement (at this point, it's a borderline fetish). Everywhere I go, I have a book. If you ever see a girl walking and reading, there's a reasonably large chance that's me (if I ever say "Totally walking and reading worthy" this is what I'm referring to). My favorite book is Anne of Green Gables (Old I know, but a classic) even though it's not my usual read. Normally, I read whatever the library carries or any YA I can get my hands on. I am a sucker for a good fairy tale... Of which there are not NEARLY enough reviews on! When Natalie (who is my church leader) told me about the blog I got really excited. A blog where everyone has a mutual book obsession???!!! OH HECK YES! "I never have time to read" is a common saying with teenagers. When people tell me that, I think to myself, "I don't have time either, but I MAKE time." I read in the car to soccer and tennis practice (I have a suspicion I'm immune to car sickness), before and after classes, while I probably should be practicing guitar or asleep. I have learned to zone the world out (I really can't hear anything, my sister tells me it's very annoying). This zoning out thing is helpful due to the fact I have 4 younger siblings and 7 younger cousins that never fail to appear when I want peace and quiet. Reading, soccer, music, anything Disney ---> this all describes me! (Oh and I'm one if those Mormon people too). Welcome Madi! I look forward to your reviews. Oh my gosh! Madi, I am so excited to read your posts. :) You are so funny and mature in your writing...this ought to be good.